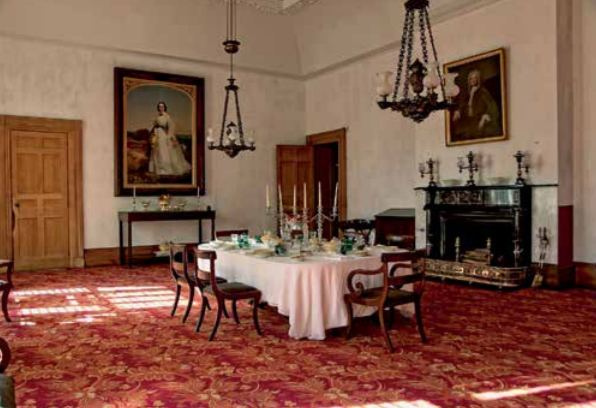 Last spring, after artist Lori Wilson (Wilson Decorative Solutions, New Berlin, NY) restored the Dining Room walls to their marbleized 1833 appearance, we were ready to install the reproduction Brussels carpet designed by David Hunt of the Vermont Custom Rug Company. 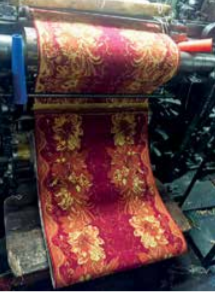 Woven on the looms of the Langhorne Carpet Company in Penndel, Penn., the highly figured Brussels carpet is an exact copy of the 1833 dining room carpet ordered by George Clarke. Closely examining original pieces of carpet that had survived on two ottomans still in our collections, David was able to precisely copy the colors and patterns that made up its body and border. With its installation in late October, Hyde Hall now boasts another great rarity in American house museums: a completely authentic copy of a carpet that once graced this elegant room. Next step: the restoration of the red, worsted wool figured damask curtains that will complete the transformation of our historic American dining room in the best French and English taste.